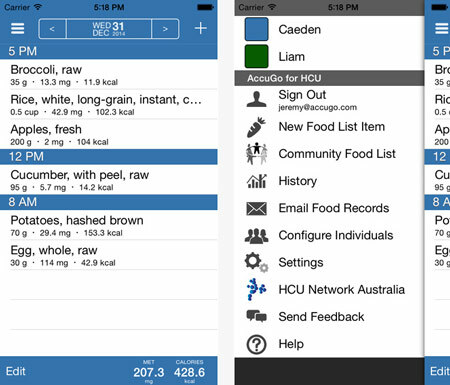 AccuGo for HCU was designed to ease the day to day management of the low protein diet by providing a quick and easy way to estimate and track protein or methionine in food eaten. It provides easy access to the protein and methionine content of foods including preloaded data and a community database of shared food. Provides automatic real time calculation of related values by entering your own quantities in weight, protein, methionine or calories. Bridgett, a mother of a 6 year old with HCU, after tracking the low protein diet for 6 years said “I no longer have to carry around my photocopied lists of food, journal to write what my son ate, or a calculator to find the relevant value. We now have a device solely used for the App so that we can hand it off to any caregiver if needed. It’s been a life saver”. Developed by AccuGo and sponsored by HCU Network Australia for the HCU community. We would like to acknowledge the contribution by AccuGo and thank them for their continued support in the Apps development. While all care has been taken in the preparation of the preloaded food items, no responsibility is accepted by the author(s) or HCU (Homocystinuria) Network Australia Inc., its staff or volunteers, for any errors, omissions or inaccuracies that may appear. No responsibility can be accepted by the author(s) or HCU (Homocystinuria) Network Australia Inc. for any known or unknown consequences that may result from reliance on any data provided on the Smartphone App.The Community Food List is a Food List that is contributed to by the community and is not preloaded. We encourage you to check the accuracy when sharing a food with the community and again when you are using the values that appear on the Community Food List.